Pahiyas Festival is an annual must-see event in the town of Lucban Quezon. It is celebrated every 15th of May to give thanks to San Isidro Labrador (Saint Isidore) for the town's abundant harvest with a grand display of colorful rice wafers (kiping), vegetables, fruits, and handicrafts adorning every house in the town. It is also believed that celebrating would ensure another bountiful harvest ahead. From Manila, take a Lucena bound bus. There are buses that has daily trips to Lucena City, located along Buendia-Taft, Pasay-EDSA, EDSA-Kamuning in Quezon City, and Araneta Center in Cubao. Upon reaching Lucena Grand Central Terminal, take a Lucban bound jeepney or mini bus. It’s just around 45 minute ride from the grand terminal. Ride a bus going to Sta Cruz, Laguna. There are bus companies located in Cubao or Buendia-Taft Ave. that ply daily the Manila-Sta. Cruz route. Get-off at Sta. Cruz and take a jeepney bound for Lucban. Take the South Luzon Expressway (SLEX) and take the Calamba exit. Pass through the towns of Calamba, Los Baños, Bay, Victoria, Pila, Sta Cruz, Pagsanjan, Cavinti, Luisiana and then to the town of Lucban. It is the first town in Quezon if you take this route. This is the best time for families living abroad to come home to the Philippines for family reunions and gatherings. So, to our friends abroad and outside Luzon, book now your flights to Manila for some kilometers of air travel and experience one of the Philippines' most colorful festivals! Pinoy Adventurista says: I’ve been to Lucban last year as a side trip for our Western Laguna road trip. My friend is asking me to join them for the Pahiyas Festival this year, but I haven’t decided yet if I will come. Maybe after my Laoag trip on May 6-8 I will be able to decide. Who’s going? @MOKS™- wahahaha!!! ako din... pangarap ko pa naman magpa-picture sa mga colorful houses dun,... Thanks Moks! @hArTLeSsChiq - wahahaha! sana nga makapunta ako...hahaha! thanks po! @Pinoy Boy Journals - papalitan natin ang date ng Pahiyas? hehehe!!! joke lang! pumunta ka ng Pahiyas sa umaga, then sa gabi ang party... go go go!!! Who wouldn't love a country that has so much to offer? This summer I'm going to Lucban for the Pahiyas. Sana matuloy na. Kasi magwowork n ko ulit so kelangan ngayon na. Laging walang opportunity before but this time I won't let this pass. Hey smart post! I was just thinking about this. I wanted to find out how to get there without having to drive or rely on a car. we are planning to visit lukban next month to see the pahiyas festival, baka naman expensive ang accomodations. pwede po bang maki-join if matutuloy ka sa Pahiyas this May 15? Thanks. 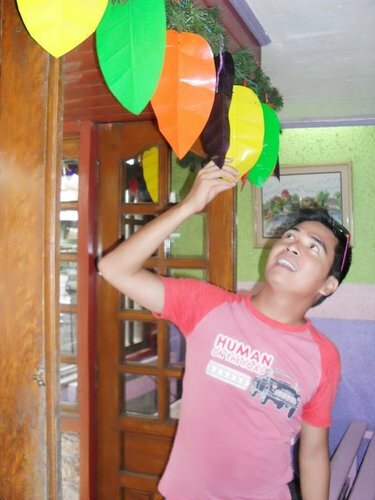 meron na kaya decorartions mga bahay ng May 12? Ilang hours ang travel time manila to lucban? Via bus transpo lang kami..tnx!